The City of Armadale has long recognised the value of working collaboratively to prevent crime and enhance community safety. The City acknowledges that matters of law and order cannot be solely the responsibility of the Police and state agencies. The community and its local government can take a complementary role within defined constraints to help make our district a safer place. Provide the ongoing security infrastructure to support the development of the Armadale City Centre. All incidents should be reported to the Armadale Police, who in turn will request footage from the City of Armadale. The system is linked to the Armadale Police Station and registered with Blue Iris (Ext.). All staff proactively report graffiti. Ensures rapid removal of graffiti from City of Armadale facilities. Provides information and support for graffiti prevention and removal. Encourages residents and developers to apply anti-graffiti coatings and to consider different styles of fencing or installation of shrubs and creepers, which deter graffiti. Engenders community awareness, ownership and responsibility. Works directly with Police to ensure a coordinated approach to identifying and catching graffiti vandals. The City of Armadale removes graffiti from its own properties and assets. Such assets include, City owned properties, boundary fences or walls facing onto ovals, parks, public access ways and open public space, park furniture and playground equipment, City signage, rubbish bins, lighting columns, bus shelters and bus stops. Graffiti removal from private residential and/or private commercial property is the responsibility of the property owner and/or manager. A volunteer community group called the Civic Pride Action Group remove graffiti free of charge from private properties and small locally owned businesses within the City if Armadale. To request their services contact 9394 5000. 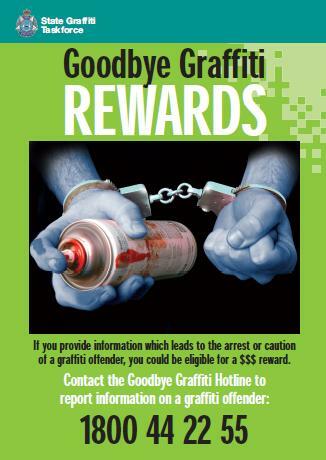 In order to report graffiti on City properties contact 9394 5000. Neighbourhood Watch aims to create a safe and secure community by encouraging people to know their neighbours and report any unusual behaviour in and around their area. Visit www.nhw.wa.gov.au for useful safety tips and fact sheets. Armadale Neighbourhood Watch is run by a group of committed volunteers. Armadale Neighbourhood Watch is actively working in the area to promote safety and crime prevention. The group is always looking for new volunteers to assist with the program. For more information or to get involved, contact Armadale Neighbourhood Watch on 0497 675 920, email armwatch@iinet.net.au or visit them in the Armadale Town Hall on Mondays or Fridays between 10am to noon. Working together as a community helps to make your neighbourhood safe, secure and vibrant for all who share it. Community interaction is a shared responsibility that has proven positive effects on building a safer community, preventing crime and developing community spirit. Ewatch is an email based system that keeps you connected to your local Police and the City of Armadale so that you can proactively make your community safer. Join ewatch to receive regular email updates on local crime trends and statistics, safety initiatives, emerging issues and community building events, as well City event information and messages. Residents are able to hire electronic engravers to identify their belongings free of charge from the City’s libraries. Engraving your valuables will assist police in the identification of stolen goods so they can be returned. You must be a current library member to hire the equipment. Street Meet n Greet allows you and your neighbours to gather for an informal barbecue and get to know each other, promoting neighbourhood security through the program. Strengthen communities to build better relationships with the people who live around you. Create a safer, healthier and more vibrant suburb. Increased safety within your street, your neighbour is the best person to realise if something is out of the ordinary. A reduction in social isolation. A host information package will be provided to help you through the event. An activity trailer is available for hire to provide access to a variety of equipment to entertain neighbours on the day, including a barbeque, utensils stereo and much more. A resident’s pack will be provided to your neighbours about home security and the facilities available in the City of Armadale. Some giveaways to give to your neighbours for participating in the barbecue. Contact Neighbourhood Watch on 9399 3514 to organise a Street Meet N Greet. Eyes on the Street is a coordinated intelligence gathering program which encourages State Government agencies, local governments and businesses to identify and record suspicious behaviour and report it to police. A number of City of Armadale staff work throughout the City and report suspicious or criminal activity. Members of the public can report suspicious behaviour to Crime Stoppers on 1800 333 000. The planning and design of places, spaces and buildings can assist in reducing crime by the application of improvements to lighting, fencing, landscaping and surveillance of the area from buildings and land use. Peoples' behaviour, particularly in terms of the possibility of offending, as well as an individual's perception about their safety, can be influenced by the design of an environment. Good design can reduce opportunities for offending and improve feelings of safety. There are many simple changes you can make to lessen the risk of crime in and around your community. The City of Armadale has developed a Self Security Appraisal form and Crime Scene Preservation fact sheet to assist you at home. Make sure your house and street number are clearly visible from the street. Empty your letterbox regularly and make sure it is secured. Lock all gates, garage doors and sheds when not in use. Install a monitored alarm system and/or security light to deter intruders. Ensure doors and windows are fitted with security screens. Avoid hiding a set of house or car keys outside of your home. Valuables should be engraved and photographed in case of theft. Record serial numbers of valuables. Become a member of Neighbourhood Watch. Inform your neighbours and get them to keep watch of your property. Arrange for someone to collect your mail regularly. Leave a spare set of keys with a friend or family member. Set timers for your TV and lights to switch on and off at regular times. Before you leave ensure all windows and doors are secure. This document was reviewed in 2008. The City continues to work closely with the WA Police and other key stakeholders to enhance community safety. If you have any questions related to the above topics or wider community safety issues please contact the Community Partnerships Officer on 9394 5689.